DNA Baits have an enviable line-up of dedicated hookbaits, in both neutral and fluoro colours. These, their dumbbell wafters, come in a choice of two sizes – either 14mm or 18mm (length). These critically-balanced, high-attract hookbaits are packed with the optimum levels of attractors, betaine and their unique, carefully blended flavours. They have been enhanced by the inclusion of an insoluble dye, to ensure that they carry a visual signal to match that of the attractor package. Wraysberries – These bright red hookbaits combine an ester-based, summer fruit flavour, alongside a special little additive, straight from the halls of Mr Wonka’s factory! Milky Malts – Everybody’s go-to colour when the chips are down, these fluoro whites have a self-explanatory name and carry that lovely, overriding warm toffee smell every time you take the lid off for a cheeky sniff. 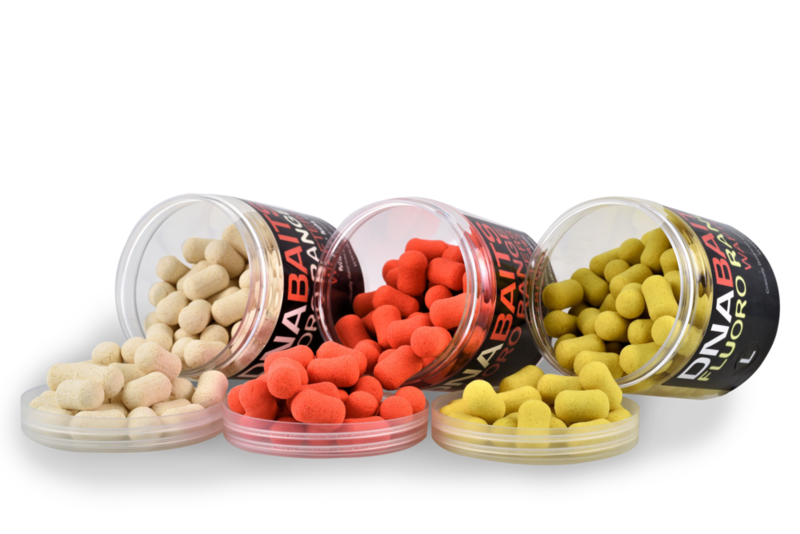 PBs – No hookbait range would be complete without the inclusion of a pineapple somewhere. DNA have given their yellows an underlying, low level hint of banana for a subtle twist on an old favourite. Fruitylicious – The fluoro orange offering. These comprise a blend of subtle fruit esters, alongside a little used, classic essential oil, giving them an almost flowery aroma. Pink Perils – The name gives away the colour of these ones. They carry a wonderful, warm spicy fragrance that alludes to every sense of winter, but don’t be fooled, they’re definitely one for all-year round use! All five are available in pots containing approximately 100 hookbaits. They can also be ordered with or without a small bottle of intense booster.